At theEword, we specialise in making social marketing work for our clients. Twitter is the latest stage in the evolution of social networking. The service has over 26 million visitors per day and the site offers unprecedented access to a number of potential consumers from a vast range of demographics. Here, theEword writer, Tom Mason offers a brief breakdown of what the site can offer. Twitter is the ideal tool for sharing information fast. Users have tweeted breaking news and events long before the media has arrived at the scene. 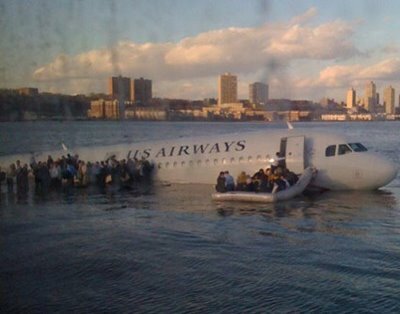 The power of Twitter as a news source was demonstrated during the crash of US Airways flight 1549 into the Hudson River, New York. Thousands of onlookers had tweeted or uploaded photographs onto the site mere seconds after the incident. "There's a plane in the Hudson. I'm on the ferry going to pick up the people. Crazy," tweeted one user. This image was uploaded by a Twitter user and featured on many of the news reports covering the event. Twitter has offered a personal insight into some of the most iconic events of the past five years. The inauguration of US president Barack Obama saw the numbers of tweets multiply by five per second as users posted their congratulations, opinions and experiences of the inauguration parade. This month also saw the first tweet from space as NASA astronaut, Mike Massimino, composed a message from the shuttle Atlantis orbiting the Earth. "Skittles got stuck in my mouth while I was driving, forced me to slam into orphanage, killing hundreds." Knowing how to implement a social marketing strategy is a necessity if you want your business to take advantage of this market. Indeed, this example – as extreme as it is – offers a cautionary tale to any company thinking about using Twitter without proper guidance. Twitter can be a great public relations tool if used correctly. Indeed, in December 2008, Huw Gilbert, communications manager for PepsiCo International, personally apologised via Twitter for a controversial television spot advertising the cola. The apology was widely thought to have prevented a public backlash against the company. Twitter has incredible potential for social marketers. It is a website which gives companies unrestricted access to millions of consumers. However, it is inadvisable for an inexperienced business to jump headfirst into a social networking scheme without proper preparation and guidance.